A Rocket Lab Electron rocket lifts off on Jan. 20, 2018, from what is currently the company's only launch facility, located on New Zealand's Māhia Peninsula. This was the second test flight of this small-satellite launcher. The small-satellite launch provider Rocket Lab plans to build a new launch site in the United States, the company announced on Tuesday (July 10). 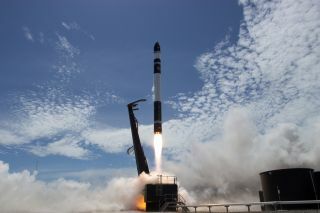 Although Rocket Lab is a U.S. startup based in California, it has launched missions only from New Zealand, where the company built the world's first private launch complex, constructed on a remote peninsula. "The four potential launch sites are being assessed against a range of criteria, including anticipated pad-construction cost and time frame, regulatory lead times, and ongoing costs once the site is operational," Rocket Lab officials said in the statement. Rocket Lab is considering both East and West Coast locations, because the latitude of the launch site determines what kind of orbit a satellite can enter. Once a site is selected, Rocket Lab will have to construct a launch tower specially tailored to the Electron rocket. The company aims to launch the first mission from Launch Complex 2 in Quarter 2 of 2019, or sometime between April and June. After that, Launch Complex 2 will be able to launch rockets monthly. For comparison, Launch Complex 1 in New Zealand can launch one rocket every 72 hours. "The development of Rocket Lab's U.S. launch site strengthens our existing position as the industry leader [in] providing frequent and tailored access to orbit for small satellites," Rocket Lab founder and Chief Executive Peter Beck said in the statement. "Launching from U.S. soil adds an extra layer of flexibility for our government and commercial customers, offering an unmatched ability to rapidly deploy space-based assets with confidence and precision." Rocket Lab's big announcement comes less than two weeks after the company indefinitely postponed its first commercial satellite launch. Engineers had discovered a problem with the Electron rocket's motor controller on the launchpad. So far, Rocket Lab has launched its Electron rocket on just two test flights; only the second mission, titled "Still Testing," successfully reached orbit.